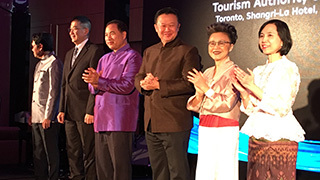 The Thai delegation joined together on stage to toast TAT’s new Canadian office. Mr. Maris Sangiampongsa, Ambassador of the Kingdom of Thailand, addresses the crowd. Dullapah Jaroenjitt, deputy director, Europe, Africa, the Middle East and Americas Marketing Group for TAT (left) and Srisuda Wanapinyosak, deputy governor for international marketing, Europe, Africa, the Middle East and Americas for TAT, were both in town from Bangkok. 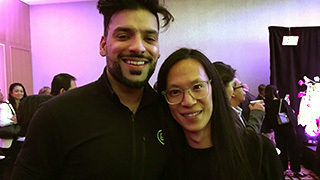 From G Adventures: Aizaz Sheikh (left), director of marketing, Canada, and Timothy Chan, public relations manager. Tina the Travel Agent also took part in the celebrations. 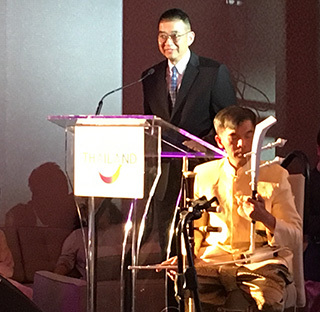 The Tourism Authority of Thailand (TAT) pulled out all the stops at a lavish reception at Toronto’s Shangri-La Hotel recently to celebrate the opening of a new Canadian office. Dancers, artisans, a live band, dignitaries (from Ottawa and Bangkok), and even Miss Universe Canada herself – who emceed the evening – were all in attendance. 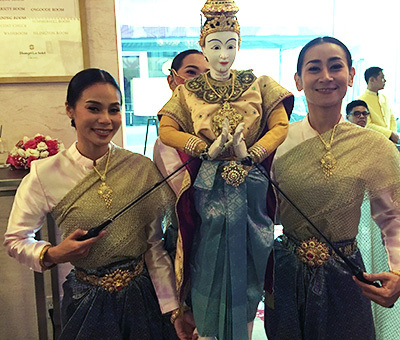 The gathering also included various tour operators, media and other industry partners, who were treated to a wide array of Thai entertainment and cuisine. Located in Toronto’s Exchange Tower at 130 King St. W., this is TAT’s 28th global office and first Canadian location. Thailand’s Ambassador to Canada, Maris Sangiampongsa, who just arrived in Ottawa from New Zealand at the end of March -- and received a classic Canadian welcome in the form of freezing rain -- also took part in the celebration. He described Toronto as a “dynamic metropolis” and Canada as a large potential market as just a couple of the reasons behind choosing the city for TAT’s new office. 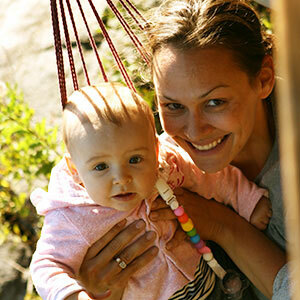 Canadian visitors to Thailand have an average stay of 18 days and spend a significant amount. Highlighting the fact that the tourism is one of Thailand’s major economic sectors, generating the main revenue for the local economy, the Ambassador detailed the country’s arrival numbers: In 2017, approximately 35.4 million tourists visited Thailand – an increase from 22.6 million the year prior – and of that, 260,000 were Canadian. Arrivals from Canada are expected to continue to grow “by approximately 5% every year,” said Sangiampongsa, despite a few key challenges, including distance, the absence of direct flights between the two countries and the high cost of airfare. 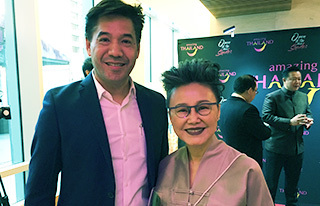 Following the celebratory toast to the new office, the deputy governor for marketing communications for TAT, Tanes Petsuwan, took to the stage to present the organization’s new campaign called ‘Open to the New Shades,’ which aims to highlight the diversity of experiences awaiting visitors in Thailand. Thai dancers perform at the TAT celebration.